If you haven't heard about it there is a new movie coming out called Divergent based on a great young adult book series of the same name. The best way I've heard it described is like the Hunger Games but more complicated. For whatever reason Amazon likes to recommend books to me as if I was a teenage girl, that's how I first found the Hunger Games so many years ago. I found myself saying about halfway in I don't think this is really targeted at an Adult Male, nonetheless I read them all and enjoyed the Divergent series a great deal. I especially enjoyed the fact that the divergent throwing knife is prominently featured in the book. I wont try and go into a synopsis of the movie (you can watch the movie trailer after the fold) but suffice to say, it is high action and weapon heavy. What Type of Knife is the Divergent Throwing Knife? Well the movie folks have great taste. The knives featured in that great scene are indeed Gil Hibben Throwing Knives made by United Cutlery. 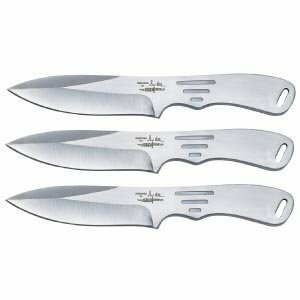 These are extremely well made knives and come in a set of 3. They are made of 1/8 thick stainless steel in a single piece. They are 8 and 5/8 in length which makes for a good size thrower. Also included is a sturdy sheath. These are great knives, and we would wholeheartedly recommend them even if you didn't come here because of the movie. They are a definite upgrade to a lot of the cheaper throwers you'll find out there and should last you for years to come. If you don't know about Gil Hibben, he is a legend in the knife throwing world and has published a fantastic knife throwing guide called The Complete Knife Throwing Guide y Gil Hibben. We highly recommend this book, its short and to the point (pun intended) with great pictures to get you throwing in no time. Perfect to get you up to speed if you're going to model 4s throwing prowess in the movie. These fine throwing knives are available at Amazon, Bladeplay and BUDK and currently run in the $30 $35 range for the set of 3. For a little look at the knife throwing scene with Tris and Four this great movie trailer should peak your interest. Throw Ninja Star Note: Don't ever throw your knives, stars or any weapon at another living thing! If you enjoyed this post we recommend heading over to our guide to Ninja Stars which covers a huge variety of different throwing options. Throwing ninja stars is our specialty although we are a huge fan of throwing knives as well.